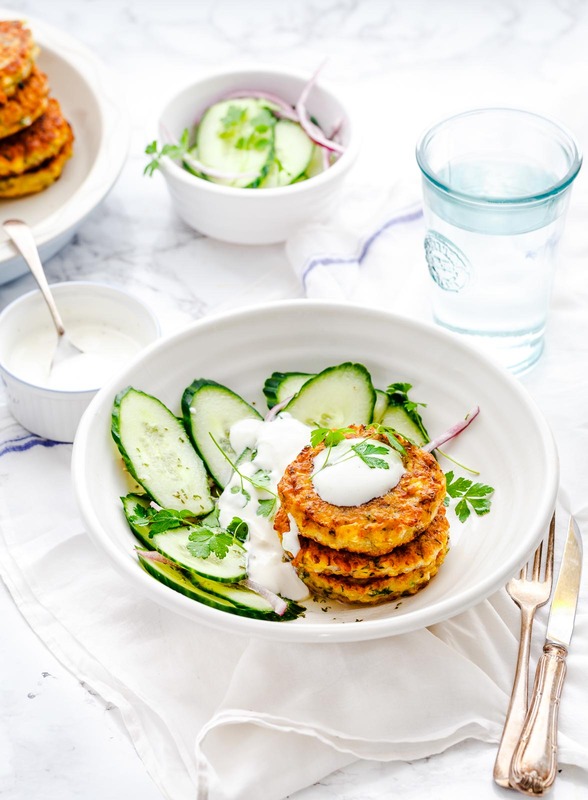 These crispy corn fritters served with cucumber parsley salad and yoghurt sauce are bursting with flavour! 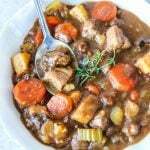 They make a hearty dinner, breakfast or even snack! 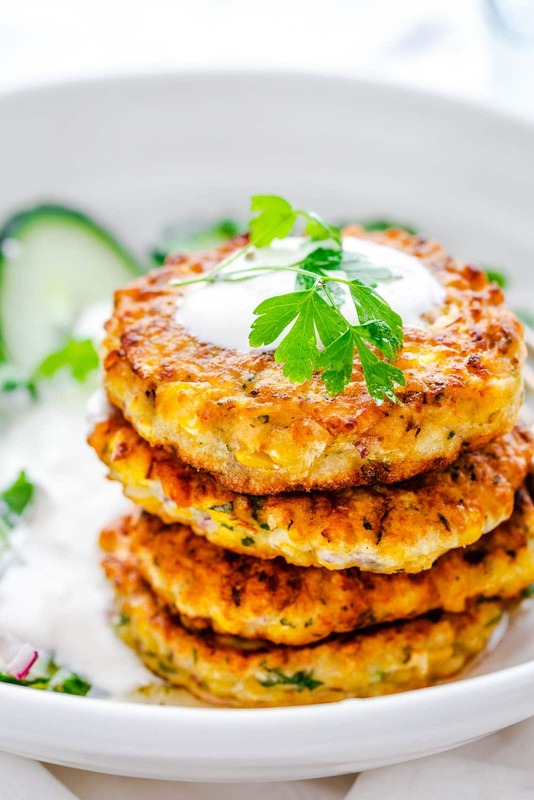 We love corn fritters in my family, they’re quick and easy to make, healthy and delicious! Comfort food at it’s best! These corn fritters only take 25 minutes to prepare and cook, and you will fall in love with how crispy these corn fritters are from the outside, but tender and soft from the inside. Corn – either use fresh corn on the cob, frozen or canned. For maximum flavour use fresh corn, but for convenience you can use either frozen or canned corn. 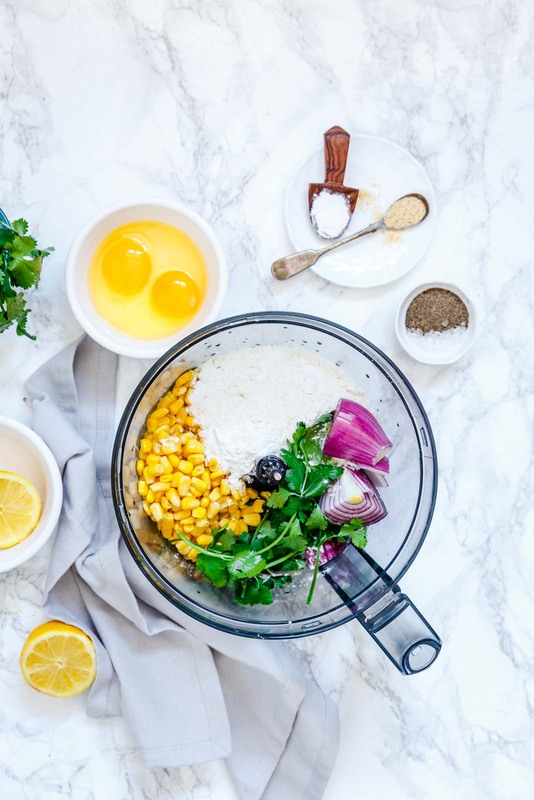 To make corn fritters, simply add all ingredients to a food processor and make the mixture. The mixture will be sticky and that’s ok. Heat a little bit of corn oil in a frying pan. Then you can either use ice cream scoop or a spoon, and scoop out 2 tablespoons of mixture for each fritter to your frying pan. Or by greasing your hands with a little bit of oil, take 2 tbsp of mixture and create flat patties between your palms. These fritters use the method of shallow frying, and that means that you will have to cook the fritters with a little bit of corn oil for around 3 minutes on one side, then flip over and cook for 2 more minutes. 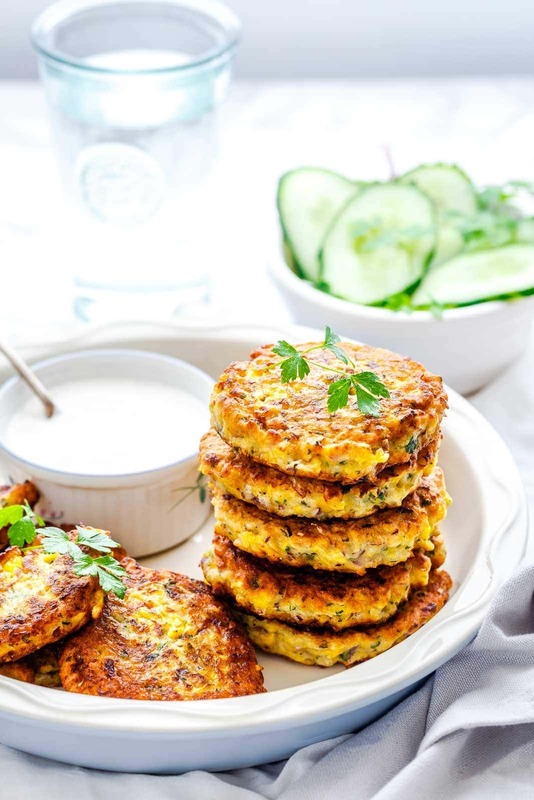 You can, of course, serve these corn fritters on their own, but for extra flavour try serving them with this really tasty cucumber parsley salad and yoghurt sauce. The cucumber yoghurt salad is very light and refreshing, and you can even serve this as a meal not just an appetiser! 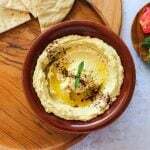 To make the salad and the sauce, simply slice some cucumbers and a red onion, add some fresh parsley leaves and make the sauce and the dressing. To make the yoghurt sauce all you need is to combine greek yoghurt with lemon juice, garlic powder, salt and pepper. And finally make the lemon dressing by mixing corn oil (I used Mazola), with freshly squeezed lemon juice, balsamic vinegar, dried parsley, ground black pepper and salt. To serve, divide corn fritters & cucumber parsley salad between 3 plates/bowls. Spoon the yoghurt sauce on the corn fritters or use as a dip. Mazola corn oil is 100% high-quality natural corn oil with a subtle taste, only extracted ‘at its peak’. 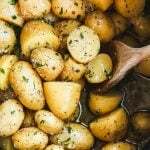 It’s high in polyunsaturated Omega 6, and a rich, natural source of plant sterols which have been proven to lower cholesterol. 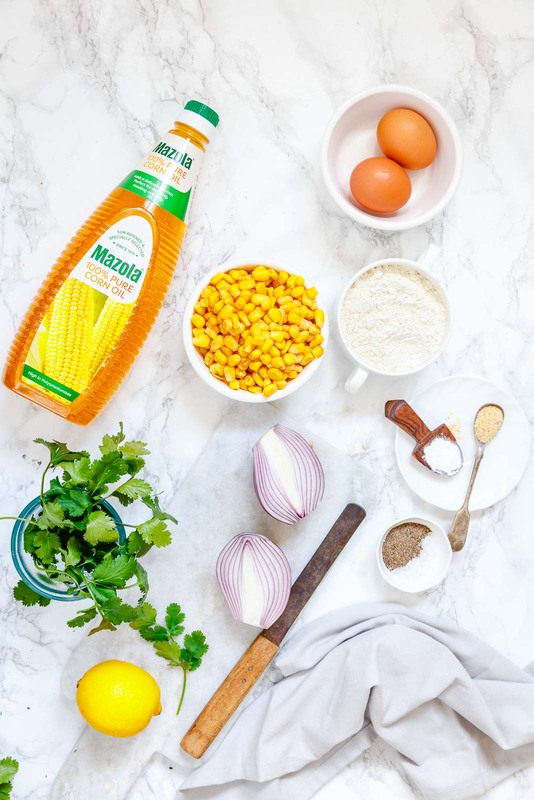 I use Mazola corn oil all the time when I cook, and it’s perfect for roasting/basting, sautéing and shallow frying. Corn fritters freeze very well. 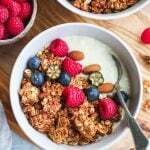 You can make the corn fritters mixture a day in advance and use it on the next day, this comes very handy when I want to make these corn fritters for breakfast. 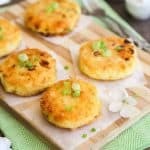 Cooked corn cakes can stay in the freezer for up to 3 months. 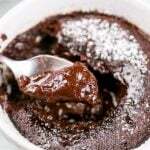 Reheat in your toaster oven or quickly in a pan and enjoy! Add spices: To add more flavour, feel free to add any dried herbs or spices that you like. You can add cumin, cayenne, garlic and onion powders, smoked paprika or even dried parsley. If you feel like the batter is way too sticky, you add a little bit of cornmeal, this will help the mixture hold together and will add a crisp exterior to your corn fritters. Use high-quality hot corn oil to fry the corn fritters. Although this is shallow frying, not deep-frying, the oil needs to be hot when you first start cooking the fritters. This will ensure that the fritters turn out crisp from the outside, soft and tender from the inside. Depending on the size of your pan, but I usually fry in batches of 5. If you’re using a smaller pan, fry 3 at a time in 3 batches and make sure that your fritters are not touching each other. When frying, gently flatten the fritters with a spoon. If you make these corn fritters, don’t forget to rate this recipe and share a picture on social media. Tag #LittleSunnyKitchen in your posts as I would really love to see your creations! Sea salt & Pepper as needed. To cook Sweet Corn from frozen, add 2 Tbsp water to the sweet corn. Cover and cook for 3 minutes in the microwave. If you are using fresh sweet corn, you don't need to do anything before you start making the fritters. Heat 11/2 Tbsp oil in a skillet. Using an ice-cream scooper, drop the fritter mixture onto the skillet. Add 2 more scoops of fritter mixture at a time, slightly spaced. Cook the fritter in medium heat for around 3 minutes, flip over and cook for 2 more minutes. Or until corn fritters are golden brown. Repeat the process 2 more times until all the corn fritter mixture is used up. Add all the ingredients in small bowl and stir well to combine. In a small bowl, whisk together all the ingredients for Lemon Dressing until salt and sugar are dissolved. Season well with sea salt and pepper. In a large bowl, add cucumber, parsley, red onions and lemon dressing. Gently toss to combine. Divide corn fritters & cucumber parsley salad between the plates/bowls. Spoon the Yoghurt sauce on the Corn fritters or use as a dip. These looks so tasty. Also quite quick to make after a busy day at work. I’m going to give the money a go! A lovely idea – I’ve saved this for a summer’s evening. They look sooo delicious 🙂 Love your photos too. These corn fritters sound healthy and delicious. They would make a perfect lunch and your pics are great! I have not made these, but they look SO SO good. I am going to have to give these a try. Oh my, these corn fritters look fantastic! So flavorful and colorful and delicious! 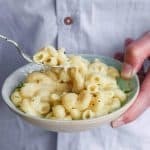 I really love the addition of that yogurt sauce! I haven’t had corn fritters since I was a kid! I’m really craving them now. Your yogurt sauce looks like the perfect accompaniment. These look so good! I love all the fresh flavors you added. I am drooling over these photos – that first one, in particular. My grandmother makes a wicked corn fritter, but I never tried to replicate. These look and sound spectacular! This sounds so delicious. I can’t wait to make it with fresh corn this summer! I don’t think I’ve ever made corn fritters – thanks for making it look so easy! I love your tips section. These corn fritters look beautiful. Perfect pairing with cucumber and yogurt sauce. 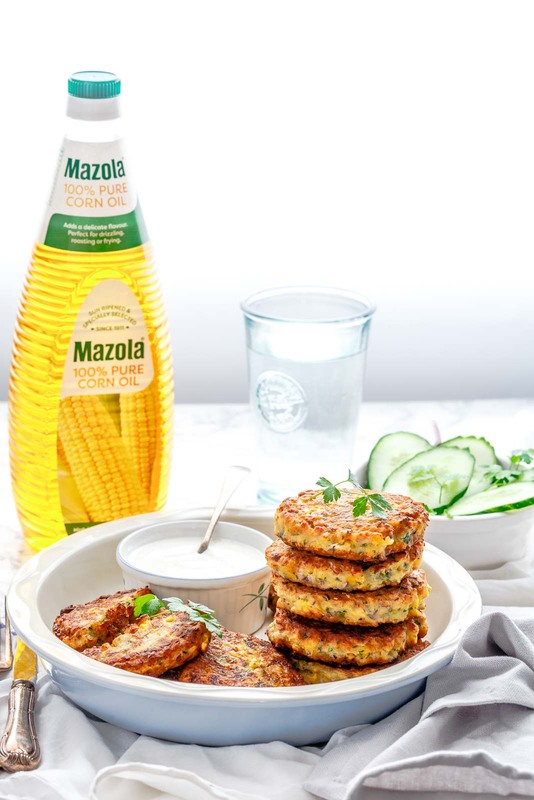 These corn fritters look absolutely delicious and that yoghurt sauce sounds like the perfect accompaniment. I’m a fritter fan, but I usually deep fry mine. I’ve never seen them done in a pan like this – great idea. Corn fritters are one of my very favorites!! I’ve pinned these to try this week!! I’m having a slight obsession with corn right now and keep adding it to dinner, so these are just perfect!! 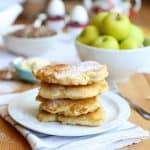 I love any kind of fritter and I have all the ingredients on hand to make these; I know what I’m doing over the weekend, these look amazing! 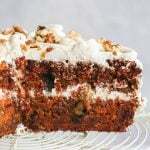 Love this great recipe ladies and your photography is truly stunning! I just want to dive right in! Yum!! I feel like this would kind of be like falafel but with corn, right? They look really good! I bet they’d even be a good appetizer!